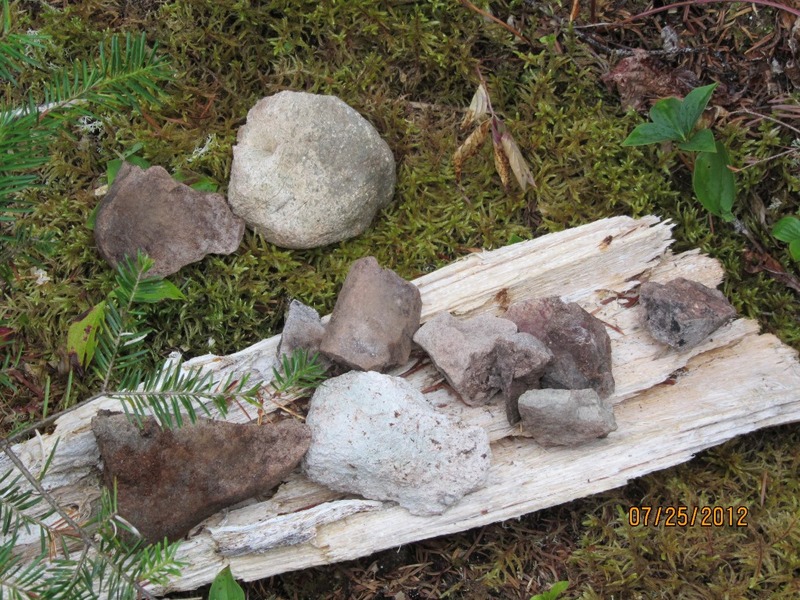 This post is part two of ‘Archaeology and the Beothuk at Indian Point, Red Indian Lake’ continued from two weeks ago. The previous post can be seen here. In 1980 the Historic Resources Division, Department of Culture, Recreation and Youth began a multi-year project simply entitled the Beothuk Project. The purpose of the early phase of the project was to locate, test, delimit and document Beothuk (and other) archaeological sites. To my knowledge, other than issuing permits to previous archaeologists who worked at Indian Point, this is the first time the Provincial Government is directly involved with Indian Point. As part of the Beothuk Project, Jane Sproull-Thomson directed an investigation of Indian Point in 1980 and 1981. In 1980 her intention was to ‘…assess recent damage to the site by both human and natural agencies, and to estimate the potential for future archaeological excavation‘ (Sproull-Thomson 1980). Over the course of two days Sproull-Thomson and her crew excavated five one metre square units and completed a new survey map of the site. Like Marshall, Sproull-Thomson noted a lot of ongoing erosion and destruction of the site. ‘Erosion has removed part of the bank on the northern side of the site, Marshall’s camp area (the sand beach) is partly underwater and forms in part a sandbar, the road is washed away at the point by the pond and the low point is under approximately 20 cm. of water. As well, the bulldozed section of the site seems to have been expanded.’ Her plan for the two days of work was to ‘…locate the cultural areas of the site reported by Locke and Devereux, and to identify Devereux’s excavations.’ To her surprise she found a lot of surface material which to her suggested intact levels below. She was able to test Devereux’s A4 locality and found an intact hearth in the area with burned bone and precontact artifacts. Testing in Devereux’s A3 south locality revealed intact occupation levels and precontact artifacts. She also thought she had located a midden ~18 metres SW of Devereux’s B5 locality. She concluded her report stating ‘The Indian Point Site, although severely damaged by logging and related activity, artifact hunting and erosion, still contains significant archaeological material of probably contact period Beothuck origin. In view of this, it remains a highly important site and one which may offer considerable insight into the Beothuck problem‘ (Sproull-Thomson 1980). Sproull-Thomson returned to the site July 1 – July 18, 1981 with the intention of assessing the potential of the site then excavate it. She opened eight one metre squares; the sole diagnostic artifact recovered was a corner-notched projectile point. Despite this, she did make some interesting observations. To her it seemed the portions of the site nearest the water appear to be mostly precontact, and those farthest back in the woods were historic Beothuk. She speculated that this was a reasonable expectation considering most Beothuk people wanted to remain hidden from Europeans (Sproull-Thomson 1981). Despite finding few precontact artifacts she did locate a new historic housepit south of Devereux’s B5 locality. The housepit had a distinct circular hearth and a possible sleeping hollow. Charcoal collected from the hearth produced a date of 150±70 B.P. (Beta-3677). Test excavations through the hearth and wall comprising four one metre squares yielded two artifacts, an iron pot fragment and a nail (Sproull-Thomson 1981). Testing of new housepit. Wall of the housepit can be seen in the photo (Sproull-Thomson). 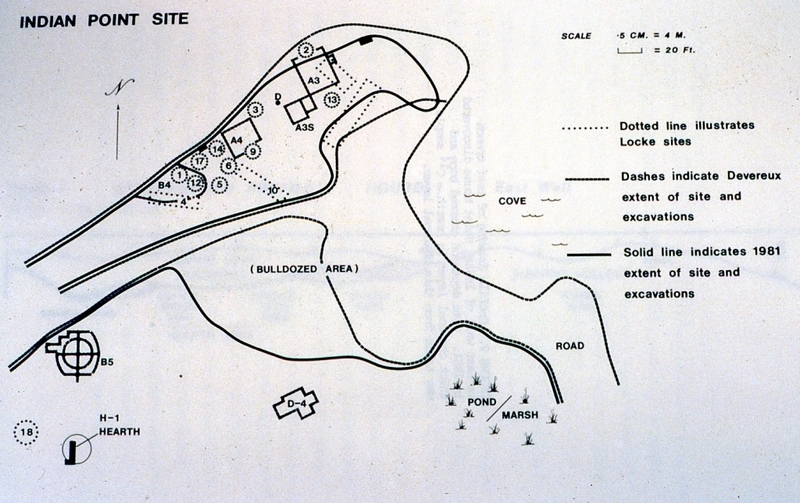 One of the concluding paragraphs of her reports states the following: ‘Our conversations with concerned people and an illustrated talk given in Millertown led the Red Indian Lake Development Association to seek help from Historic Resources in applying for a federal grant to begin development of the Indian Point site as an interpretive park. At this writing, funds have been awarded and work has begun on cleanup of the site and repairs to the access road. It will be an enormous satisfaction to see this aboriginal settlement take its rightful place in the Province’s history‘ (Sproull-Thomson 1981). View to the SW in 1981. The main areas of Devereux’s work, localities A3, A3 South, A4 and B4 were located to the right in the photo among the trees and bushes on the small hills. Marshall had camped on the opposite side of those bushes in 1978 on the exposed lake side of the point (Sproull-Thomson 1981). Jane Sproull-Thomson’s map of Indian Point showing Locke’s features and Devereux’s features. The previous photo was taken with the photographers back to the cove looking down the site to the SW (Sproull-Thomson 1981). From this point on, no more in depth archaeological work occurs at Indian Point and the site has periodic visits by various archaeologists. In 1982 Callum Thomson conducted an archaeological survey from Red Indian Lake to Grand Falls along the Exploits River from May 29 to June 19. Before they started the survey they stopped at Indian Point where the Red Indian Lake Development Association was preparing the site for its future use as a park and interpretation centre. Thomson noted, in particular, that ‘We were relieved to note that the few intact parts of the historic and prehistoric site had not been endangered in the clean-up process.‘ On June 19th they returned to Indian Point, ‘Here we were devastated by the new appearance of the Indian Point site. 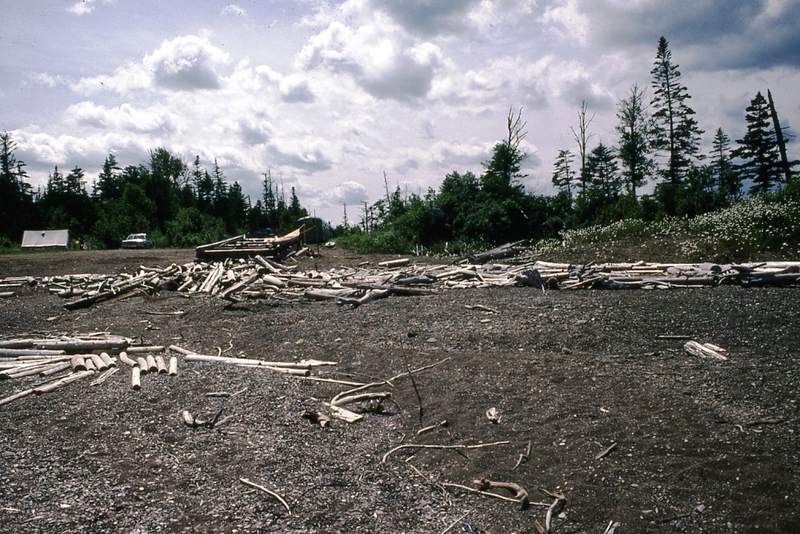 One or more members of the Red Indian Lake Development Association had authorized bulldozer stripping and leveling of parts of the remaining cultural deposits, resulting in the partial destruction of habitation structures, middens, hearths and the scattering of artifacts, animal bones and charcoal, with a consequent loss of archaeological context and information. This grossly negligent act underlines the absolute necessity for developments of this kind to be approached slowly and carefully, under the constant supervision of a professional archaeologist. While ultimate responsibility for this type of destruction is accepted by the Historic Resources Division, which approved the original plans, it will continue until more staff and resources are made available for the immense volume of work generated by the Historic Sites and Objects Act‘ (Thomson 1982). Six photos stitched together showing Indian Point in 1985 after the leveling of the site in 1982. This photo is taken from the same general area as the Sproull-Thomson photo in 1981. Completely gone are the small bushes, trees and small hills on the right side of the photo that held Devereux’s various site localities (Thomson 1985). Callum Thomson and Don Locke conducted another survey of Red Indian Lake and Exploits River in 1987 to inspect several archaeological sites that were known to Locke. Once again they started at Indian Point noting the location of disturbed and eroded habitation areas. Despite this Thomson notes ‘There are still, however, several known areas of intact deposits and probably some unknown areas.‘ He does not state where these areas are located. They also inspected the area east of the main site at Indian Point which Locke had found in the 1960s. More archaeological material was found here. In fact it appears as though Indian Point would have extended over most of the point and well into the cove to the east. Unfortunately, most of this portion of the site has eroded (Thomson 1987). Cove to the east of Indian Point (right side of photo) showing erosion of the shoreline (Thomson). In 1992 Fred Schwarz conducted a major archaeological survey of the Exploits Basin from where the Exploits River empties into the Bay of Exploits back to Red Indian Lake. While he did visit the site he did no actual work there (Schwarz 1992). Charles Burke, representing Parks Canada’s Atlantic Service Centre, visited Indian Point in 2002 in order to assess the extent of purported damage to the site. Parks had learned that a parking area had been constructed in the area of Helen Devereaux’s excavations, essentially bisecting the site. Burke also observed damage due to shoreline erosion. In 2009 archaeologist Laurie McLean was hired to conduct an impact assessment at Indian Point for the installation of a Hydro-Meteorological (Hydromet) Station. A total of 27 test pits were dug where the station was to be installed and three more were dug in a line on the beach, following the route for a buried cable which was to run from the station to Red Indian Lake. The test pits on the beach were sterile while five of the 27 test pits dug on the level terrace above the beach contained badly waterworn stone artifacts. Finally, Provincial Archaeology Office (PAO) staff has made several visits to Indian Point over the years. Mostly these were brief visits to check on the site’s condition. In 2012 PAO staff made a visit to the site while in the area on other business. While we did not find in situ remains, we did find plenty of fire-cracked rock on the surface and reason to believe the site may yet have in situ deposits. Fire-cracked rock seen at Indian Point in 2012. There is also a local group called the Red Indian Lake Heritage Society who try to monitor the site. 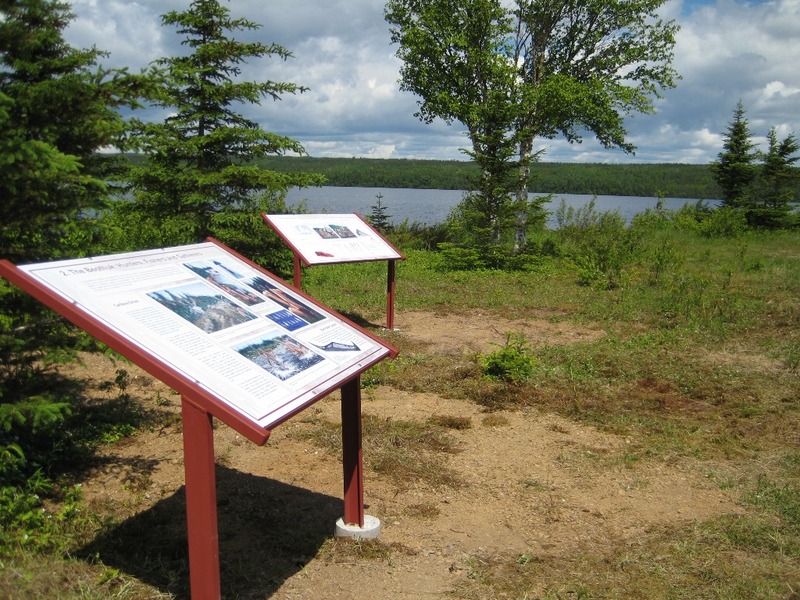 In 2009 they had a series of interpretive panels installed on the point (the PAO tested the location of the panels prior to their installation). The panels tell the story of the Beothuk who inhabited the Red Indian Lake region. The society did such a good job with the panels that they were awarded the Manning Award by the Historic Sites Association in both the National Category and the Overall Winner for 2011. Interpretive panel at Indian Point. In the end what have we learned from Indian Point? In the very least we learned that the site was used in the precontact period and the historic period by both the Beothuk and their precontact ancestors. While living at the site in mamateeks (or wigwams) they had been processing caribou and making tools from stone and iron. It also appears that they may have been applying ochre to a canoe. These are all good things to know, however, Indian Point has much more to teach us. To paraphrase an archaeologist who helped me with the post, the history of this site is nearly allegorical, symbolizing all over again the end of the Beothuk, and, once again, our helplessness in the face of forces that no one could control (1829 all over again). What can we take away from the story of Indian Point? Is there a lesson-learned component to it? Has it led to any particular action by the Government of Newfoundland and Labrador? These are open questions that we can all try to answer. I know the Provincial Archaeology Office (PAO) now consists of four people who collectively have more than 100 years of archaeology experience, this places the PAO much farther ahead of the Culture and Heritage Division in 1982 when Callum Thomson was asking for more staff. I know since 2003 the PAO has reviewed more than 1500 Land Use Referrals per year, in the last four years that number has risen to more 2500 per year on average. So a land use referral for something like an interpretive park, such as was proposed for Indian Point in 1980, would be closely scrutinized by PAO staff. I also know that when a development, such as an interpretive park, is proposed in an area with archaeological potential or a known archaeological site the PAO will implement mitigative measures whether it be require an archaeological assessment, monitor construction, require buffers, etc. While these improvements are not a direct result of Indian Point, hopefully they will prevent another Indian Point. Have we learned the lessons of Indian Point? I hope so. 2009 Preliminary Report for Permit 09.48 a Stage 1 HRIA at Indian Point, Red Indian Lake. 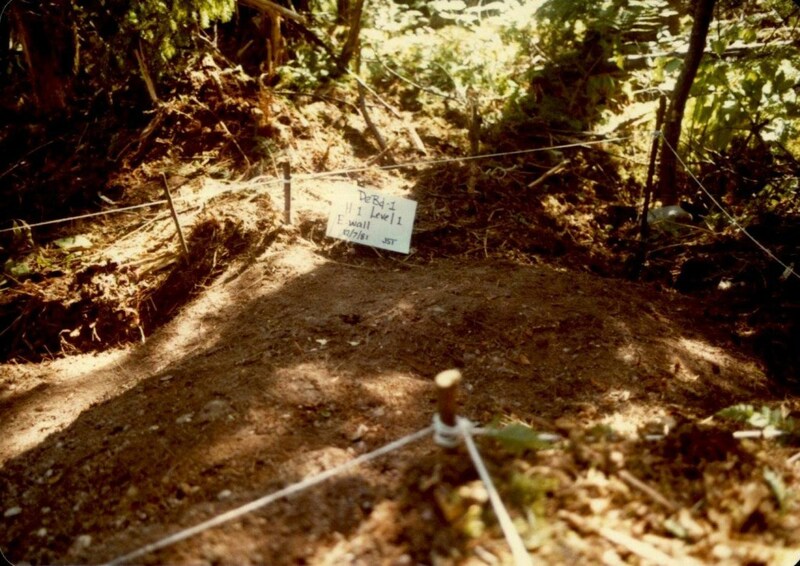 1992 Archaeological Investigations in the Exploits Basin: Report on the 1992 Field Survey. 1980 Red Indian Lake ‑ Indian Point Site Survey ‑ June 20‑21, 1980. 1982 Investigations at Red Indian Lake. Archaeology in Newfoundland and Labrador 1981, Annual Report No. 2. Edited by Thomson, J.S. and C. Thomson; Historic Resources Division, Government of Newfoundland, pp 174-189. 1982 An Archaeological Survey of the Exploits River from Red Indian Lake to Grand Falls May 29- June 19, 1982. 1987 Archaeological survey of Red Indian Lake and Exploits River with D. Locke 1987 10 27-29. I enjoyed Reading your article(s). However I believe far too much interest has been paid to the Indian Point site and not nearly enough to a site which was likely and more probable a site for the Beothuk Winter Camps located at the inflow of the brook located approx. half a kilometre east of Indian Point. This is the location which Shanawdithit shows on her sketch as having three wigwams. I personally have found the remains of very old bones in this area (likely from caribou) which have not been local to this area since the town of Millertown was formed in the early 1900’s. What has been overlooked time and again at the Indian Point site is the absolute lack of running water. These inland camps of the Beothuk were mainly Winter camps and unless they were going to chop through three to four feet of solid ice with a stone axe to get to the Lake water, they would need a ready and easily accessible source of drinking water. The only source of running water in this area that would not have frozen solid in the Winter months is at this brook. Unfortunately (and as I notified Laurie Mclean back in 2012) this site has been awarded to a developer to build Cabin Lots along the shore of Red Indian Lake. I have searched through every source readily available and can find absolutely no indication that there was any sort of an assessment made on the archaeological significance of this site prior to it being awarded to this developer by the Newfoundland Government. This site is very likely the site of the Beheading of Buchans men in 1811 and based on that fact alone it should have been protected from development of any kind. As of right now there as been minimal actual development to this site but unless there is immediate action this site, will be lost forever of any artifacts that may be found there. Again, thanks for the comment. The land you are referencing was thoroughly searched prior to the cabin development in fact nearly several hundred testpits were dug. Feel free to contact the PAO pao@gov.nl.ca or http://www.btcrd.gov.nl.ca/department/contact_arts.html#pao. Unfortunately, as you are well aware, the lake shoreline has been heavily impacted by logging and water level fluctuations over the decades since the dams were built. If we have learned anything from the close study of Indian Point it’s that the chances of anything being insitu, in context, along that shoreline is extremely unlikely. Hence part of the reason no underwater work was done. The problem comes from the amount of disturbance because of the damming, water levels, ice rafting and logging. The artifacts themselves are not the most important part it’s the context, where the artifacts are found in relation to each other and site features. That has been destroyed. OK, we are going to agree to disagree on most if not all of this.